Home | Newsletter 151: Eat bananas, have a job, or own a business? You may want to read this! Now Is the Time for Fair Wages! This past weekend we facilitated a panel on raising the minimum wage. Most of us are familiar by now with the worker-led Fight for $15. This movement has been an important and powerful force for change. But less visible is the fact that most small businesses also support raising the wage. Our panel, part of the largest U.S. trade show for the natural and organic products industry, focused on the business case for fair wages. 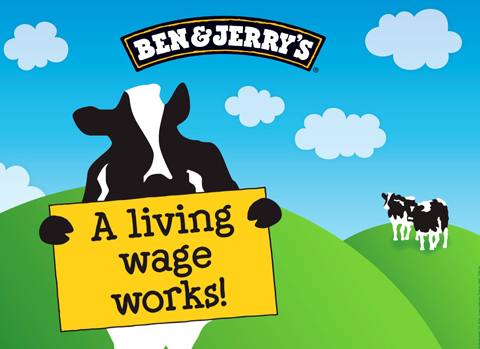 Leaders from Dr. Bronner’s, Ben & Jerry’s, and Cambridge Naturals shared their view that not only is raising the wage the right thing to do, it’s also good for business. Whether you are a worker, small business owner, retailer, consumer, or some combination, now’s the time to get involved in the movement for a fair wage. California, Colorado, Arizona, Maine, and Washington DC are all considering ballot initiatives to raise the wage this year. You can get involved through the Fairness Project. Learn more about the effect of raising the wage and ideas for getting involved, including a webinar for businesses and retailers wanting to get involved hosted by Dr. Bronner’s on an information sheet we developed. Everyone can take action to let your members of Congress know you support raising the federal minimum wage to $12/hour by 2020. Bananas are popular, convenient, nutritious, and cheap. But how much do you know about how they are produced and the farmers who grow them? Did you know that small-scale farmers are struggling to survive because prices for bananas are kept so low by retailers? 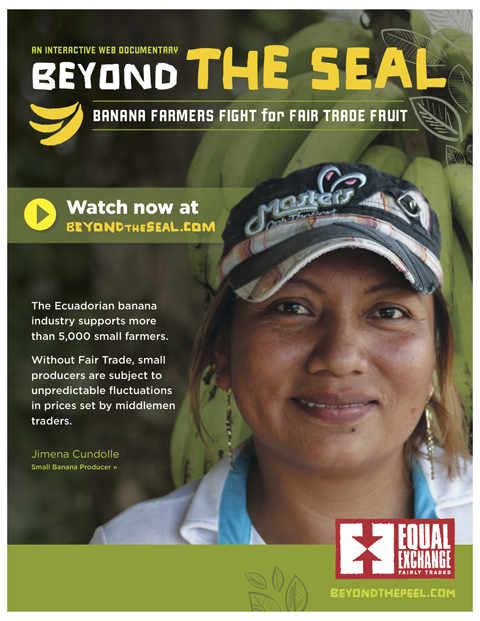 Or that many small-scale farmers produce bananas organically but do not qualify for certification because they are too close to conventional farms or contaminated by pesticide drift? Learn more and find out what you can do by watching this web documentary highlighting the work of Equal Exchange. The World Social Forum brings together leaders and activists from diverse social movements – for example climate change, indigenous rights, and food sovereignty – to find common ground and points of connection to strengthen the movement for global transformation. 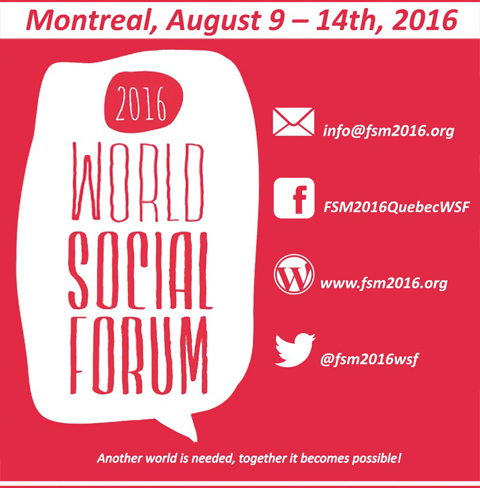 This year the World Social Forum takes place August 9-14th in Montreal. Save the date! And stay tuned for more information about the fair trade village and workshops where you can learn more about the movement small-scale farmers who are organizing to change the terms of trade to put people and planet before corporate profits. <An indigenous environmental activist murdered in Honduras, the only witness injured and held captive: analysis from Food First. <Behind your (conventional) chocolate bar, we still have a huge child labor problem. < Dr. Bronner’s makes the business case for a fair wage for all. New study from University of California – Berkeley shows positive impact, small net gains in jobs from New York’s proposed $15/hour minimum wage.